College (Latin. Collegium) a group or community working for a common goal. The simple fact is that in the longer term, our church presence here at the White House in Mettingham will require resident staff to carry out the daily ecclesiastical duties as well as the many domestic tasks around welcoming College guests and pilgrims. At this stage in our development, we do not know if this will evolve as a monastic community, a lay community or, as in the ancient Mettingham College, a clerical community. The word 'college', therefore, covers the different forms the resident community could take, according to God’s will, in the pursuit of the common goal: serving the Orthodox Church. In order to safeguard the estate in perpetuity, it was necessary to place it under the auspices of a registered charity so that it could formally become church property with a resident community. To this end, in February 2012, the Mettingham Orthodox Trust was founded to care for the upkeep of the College and ensure that it meets its stated aims as expressed in the Trust Deed. One of the central aims of the Trust is education and the promotion of the Faith by various educational means including lectures, seminars, workshops, exhibitions, and the production of teaching materials. 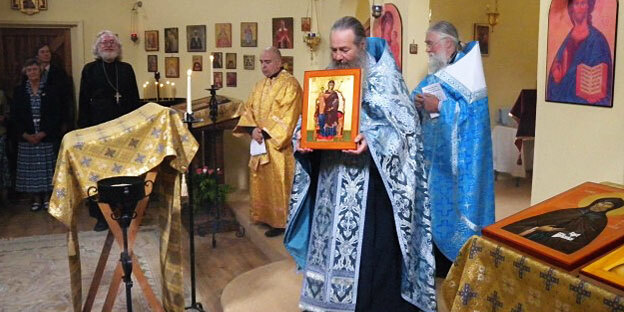 In the fullness of time, the College will hope to develop a programme of educational, pastoral and spiritual events on different aspects of the Orthodox Faith in response to the varied needs of the faithful. Furthermore, since the St George Orthodox Information Service already has an extensive distribution network, this lends itself neatly to distributing printed and other teaching resources produced by the College. Not to be forgotten in all of this is our foundress, Mary Bond, of pious memory, who reposed in the Lord in November 2010 and is buried on the South side of our church. We are conscious of the fact that, for two hundred years, in Medieval times Mettingham was renowned for its illustrious College dedicated to the Virgin Mary situated in the grounds of Mettingham Castle. This was a chantry college, which as well as educating students, prayed daily for the repose of the soul of its Founder. It is obviously not our wish to recreate or reproduce every aspect of the former Mettingham College, never-the-less the Church has always prayed for the repose of the souls of the faithful departed alongside its prayers for the health and salvation of the living, and this is certainly an integral part of the daily liturgical life of our church presence here, and a point of connection with the ancient chantry College in Mettingham. Mary’s memorial is not a building, however much we might love and value our church, but it is an active and living community serving God. We seek to serve the Church in a pan-Orthodox way and are building up the facilities and resources that will achieve this. The trustees have a flexible approach to the means and methods that can be employed to disseminate the Faith. We are willing to listen and to respond to the voice of the Church in this country and are always grateful for feedback and suggestions as to how the resources we have been given can be best used for the upbuilding of Christ’s Church. The needs are great and the labourers are few in number but, with God’s help, we will be tireless in our efforts.